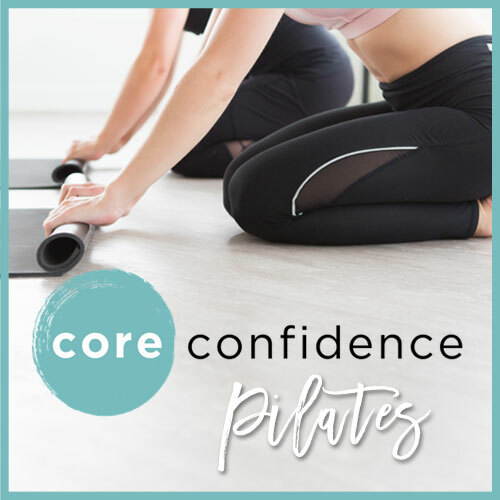 Thank you to Pure Encapsulations for partnering with me on this post. While I use and recommend Pure products, the opinions expressed here are my own. I love trying new stuff. I love learning new things and widening my network of knowledge. 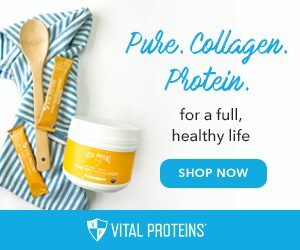 So when Pure Encapsulations offered me the opportunity to try out PureGenomics® I was totally in. PureGenomics® is a platform designed to help interpret your genetic test results in order to provide a more personalized nutrition and /or lifestyle recommendation. They use your 23andme® genetic data. I had already gotten my 23andme health and ancestry data a few years ago so I was up and running in no time. Your 23andme raw data is uploaded into their application, which then provides reports on SNPs that are relevant to health, validated by published research, and responsive to nutritional support. What are SNPs, you may be asking? SNP is an acronym for Single Nucleotide Polymorphisms. SNPs are common genetic variations that change a gene’s “instruction manual,” encoding a protein that may have an altered shape, activity, stability or abundance. A given SNP may occur in one or both copies of the gene. If found in only one copy, you are heterozygous (-/+) for the mutation. If the SNP occurs in both copies, you are homozygous (+/+) for the mutation. A homozygous genotype can have more significant health implications compared to the milder heterozygous genotype. 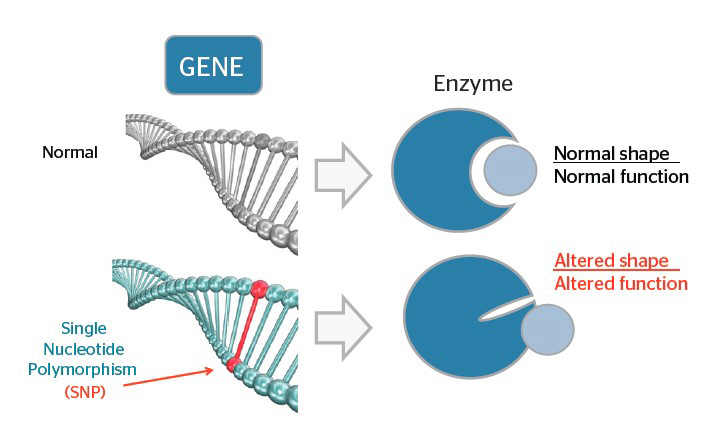 More than half of the population has SNPs that reduce the activity of one or more enzymes by up to 70%. There are quite a few SNPs that directly affect nutrient assimilation and response to supplementation. That being said, most SNPs have no effect on physiology and lack any medical relevance. PureGenomics® reports only on SNPs that are relevant to your health, that are validated by published research, and that are responsive to nutritional support. I think it’s important to discuss how the results are interpreted. First and foremost, let’s address the science. As an evidence-based practitioner myself, the science is really important. PureGenomics also assigns each SNP a scientific rating (1-5 stars) on the basis of the size of the studies and whether the findings were replicated in separate investigations. For example, a SNP with a five star rating is based on a study of 5000 or more subjects and the findings have been replicated in at least 1 additional study. A SNP with a one star rating is based on 1 smaller study without replication. As new research is published, the rating system and the individual ratings for each SNP are updated in the PureGenomics application. It’s not recommended that you dive into all of these at once, as a practitioner or as a patient. It can be a lot of data to absorb and this type of information can be just as scary as it is empowering. PureGenomics suggests you begin with methylation issues first, since over half of the population carries genetic variations that affect the methylation pathway. Methylation is a biochemical reaction in which a methyl group (CH3) is attached to a molecule, converting it to a different molecule. The enzyme MTHFR converts folic acid and THF into 5-MTHF using riboflavin as a cofactor. If you are homozygous (both gene copies have the SNP) for the MTHFR C677T SNP, then MTHFR functions at only 30-35% of its normal rate. If you are heterozygous (only one copy has the SNP), MTHFR functions at only 70% of its normal rate. As a result, folate conversion to 5-MTHF is reduced and homocysteine is not methylated as readily. Elevated homocysteine in the blood is a risk factor for cardiovascular disease. 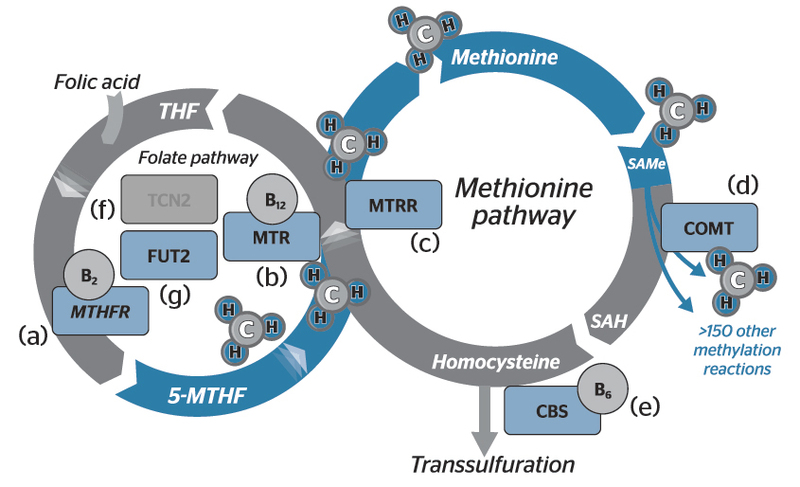 Methylation requires a variety of nutrients and plays an indispensable role in neurotransmission, hormone detoxification, amino acid metabolism, vitamin assimilation, homocysteine clearance, cell membrane structure, and gene regulation. 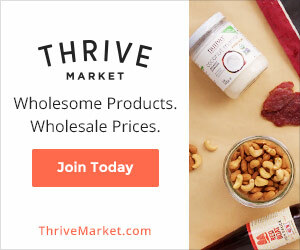 All of these functions maintain our cardiovascular health, detoxification, neuro-protection, cognition, emotional wellness and cellular protection. So if there are methylation concerns, it’s best to address these first! The vitamin and mineral focus area is another great tool. For example, the GC gene encodes vitamin D binding protein, which transports and distributes vitamin D throughout the body. Studies have linked this SNP with lower vitamin D levels, even with adequate dietary intake and/or sunlight exposure. This means you may be prone to deficiency and require a supplement to maintain optimal levels. Again, you can corroborate this result with your labs. Another great example is the FADS gene. 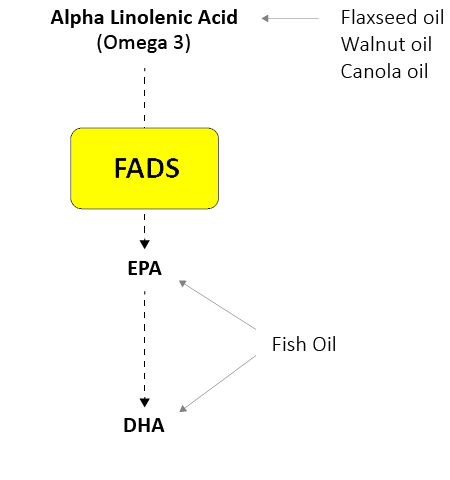 FADS (fatty acid desaturase) converts fatty acid precursors to active omega-3 fatty acids (EPA and DHA). The homozygous and heterozygous genotypes have a diminished capacity to convert omega-3 fatty acid precursors (linolenic acid from flaxseed oil and other plant oils) to EPA and DHA. This means you want to ensure an adequate intake of omega-3 fatty acids from cold-water fish or fish oil because plant sources of omega-3 precursors (like nuts, seeds and seed oils) may not provide optimal support. This can be of significance to you (or as an RD, your clients) if you are a vegan/vegetarian, or if you have a seafood allergy. 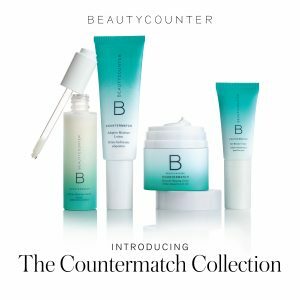 While genomics is a very new (and exciting!) 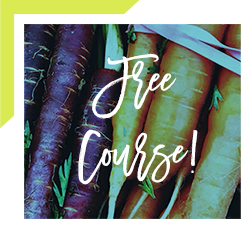 field of practice, it’s important to understand that this is just another tool in the RDs toolbox, getting us closer and closer to providing truly personal nutrition recommendations. 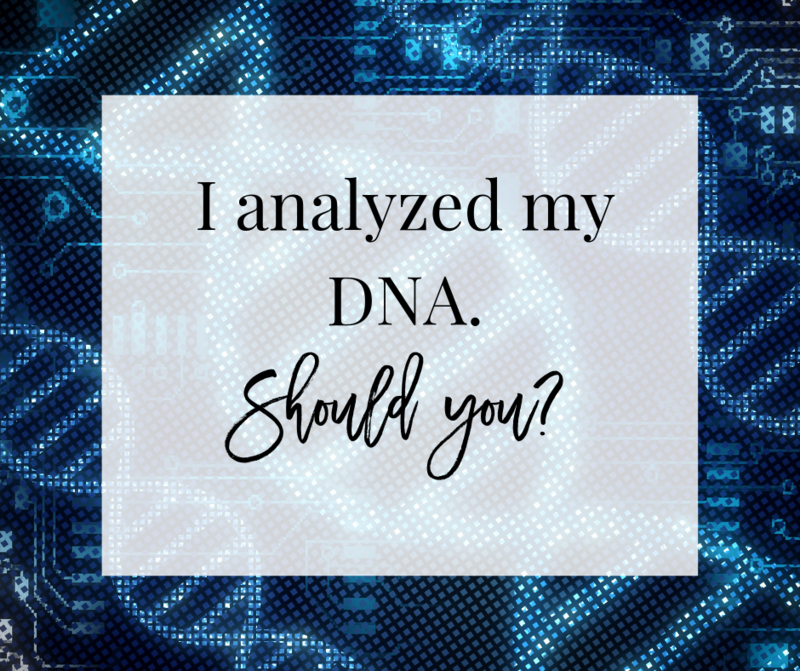 As Dietitians, genomics gives us some leverage outside an “educated guess.” I like to think of it as having an edge on better understanding the symptoms our clients are having and further illuminating what might be going on inside the body. But the idea is not to just prescribe supplements or lifestyle interventions when there’s no symptomology. You don’t want to make blanket recommendations in isolation; results should be validated and corroborated by labs, family history, health history and what symptoms your client is presenting with. The expanding field of nutritional genomics holds tremendous potential for Dietitians to lead the way in recommending personalized diet and lifestyle protocols. To learn more about using PureGenomics® in your practice, click here. For a great video explaining how your DNA is used to make recommendations, watch this. To learn more about working with me to evaluate your own genetic data, click here.